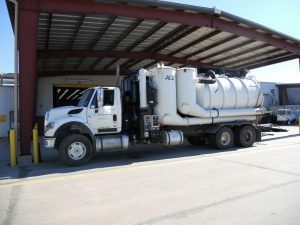 Contact us today if you need vacuum truck services! What exactly does vacuuming mean and why is it necessary? We can vacuum most unwanted material from your site. Our vacuuming services are necessary to ensure ongoing production, keep safety regulations intact, and maximize productivity of the manufacturing process. What can vacuum trucks be used for? We commonly use our vacuum trucks to move solids, sludge, dry power, and liquid material. With our exceptional trucks, we don’t have to be extremely close to the material that needs moving. Material can be vacuumed from long distances, overhead, or below grade. What applications can use our vacuum truck services? Call us today at any of our four locations for your vacuum service needs!